Galaxy Note is one of the Samsung flagship products. It seems they put a lot of efforts promoting it. Is it worth to buy? What are this phone (or tablet) advantages and disadvantages? If you are curious, read our complete review below. Note: The sales package might be different in your area. First, I will review Samsung Galaxy Note N7000 design. Due its size is larger than most of Android phone but it’s smaller than a tablet, many people call the Note as a phablet, is a combination of Phone and Tablet Word. In my opinion, this gadget is looks like phone rather than tablet. Note has dimension 146.9 mm length, 83 mm width and 9.7 mm thick. It’s pretty wide thus makes the user unable to perform typing with just one hand. Below is Samsung Galaxy Note in my palm, you can imagine how wide this gadget is. The build quality is good, the buttons are comfortable enough to use and it feels solid to hold. The front area is dominated by screen, below the display you can find the MENU Button, the HOME button in the middle and the BACK button. The MENU and BACK button is touch button while the HOME button is mechanical. Samsung GT-N7000 has no d-pad navigation, trackball, trackpad, etc. At the front side, you can also find the 2 MP cameras, light and proximity sensor that located in the upper right corner of the screen. On the back side you can find the 8 MP cameras with the flash LED and a mono speaker holes. To open the battery, you must remove all of the back cover. At the bottom of Samsung Galaxy Note, there is a micro USB Port and the S-pen holder. At the top side, there is a 3.5 mm universal audio jack. On the left side of the phone, there is volume button and on the right side, there is only a power button. Samsung Galaxy Note N7000 has no dedicated camera button yet HDMI port. Personally, I think there is nothing special about the design and rather look simple. It’s like Galaxy SII on bigger size. 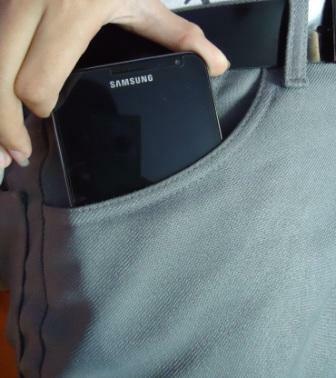 Can Samsung Galaxy Note Fit in Pocket? This question is commonly asked by men who are generally put the phone in his pants pockets. For most of women, usually carry the phone on the purse, so it won’t be a trouble at all. Will Samsung Galaxy Note fit in pocket? The answer is yes and no. It will pretty easily fit in the pocket if you use not so tight pants. Actually it even fit in tight jeans if you try hard enough, but I won’t suggest it because it’s uncomfortable and put a lot of stress to the screen. I already tried to put Galaxy Note on my suit trousers front pocket. I tried to bring note for all day long in my pocket, overall it still comfortable to bring even thought when I sit. It’s not much different like bringing phone that has a 4 inch screen. I believe this is because the Note is quite thin. 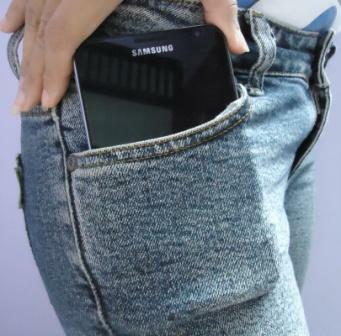 If you doubt whether the Samsung Galaxy Note will fit in your pocket or not, try to put your entire hand palm into the pocket. If you still feel comfortable, then this gadget will fit in your pocket without a problem. Now I will review Samsung Galaxy Note screen. 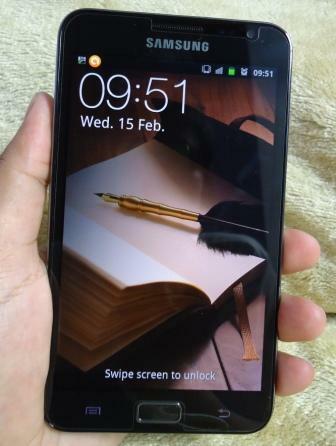 This phablet use 5.3” screen, 800 x 1280 pixels, with Super AMOLED technology. It is one of the best screens on Android platform nowadays. The images and text on the screen is sharp, detail and the color looks beautiful in high contrast. You can still read a really small text in full zoom out mode. The outdoor performance is not bad either. The text is clearly visible on direct sunlight. The screen is capacitive type; it’s responsive to your touch. It supports multi touch up to 10 touch points. In this section I will review Samsung Galaxy Note performance and also its gaming capability. This Android phone use Exynos chipset, 1.4 GHz Dual Core ARM Cortex-A9 processor with Mali 400-MP GPU (Graphics Processing Unit) and 1 GB RAM. Just like the screen, this gadget core is one of the best out there. For the operating system, it uses Android Gingerbread v2.3.6. When tested using synthetic benchmark applications Quadrant standard, Samsung Galaxy Note get scores 3700. The score is slightly better when compared with Samsung Galaxy SII that gets score around 3500. It is pretty awesome because the Note use bigger screen resolution (800 x1280 pixels) than Galaxy SII (480 x 800 pixels). Despite having a high score on the benchmark application, but switching between menus on Galaxy Note sometimes a little bit laggy. But don’t worry, this doesn’t interfere with the operation and in fact many users won’t notice it. What about Samsung Galaxy Note gaming capabilities? We try to install three HD (high definition) games from various genres, which are football game, tower game and car racing game. All of games running perfectly fine and smooth. With a larger screen size than other smart phones, not so heavy, and fast processor, it seems that this phablet is qualified enough as your portable gaming device. For the record, although the Samsung Galaxy Note has high hardware specification, but it’s not a guarantee that all games are can run well on this device. This is not because the specification is less powerful to run the game, but this is because Android games are usually made specifically for a particular processor or GPU. So the game that can run smoothly on one type of Android phones, not necessarily be going well or run perfect on other android phones. The camera quality is not much different with Samsung Galaxy SII. The resulting image has little noise, have good contrast levels and high detail. The camera has LED flash light that come handy to capture a moment in a dark place. One camera feature that I love is the touch focus. To use this feature you just simply touch the object image shown on the phone screen and the camera will automatically focus on the selected object. Overall I’m quite satisfied with the Samsung Galaxy Note camera. If you have this phablet, there’s a big chance you will leave your compact camera at home. Now I will review Samsung Galaxy Note Video quality. This Android gadget can record full HD 1080p (1920×1080 pixels) video. When it use to record at 1080p, the field of view is quite narrow. If you record in 720p, the field of view is wider, but not as wide as when taking photos. Video recorded in MP4 format. 1080p video in one minute consume over than 100 MB memory. When used to record 720p video, it consume more than 80 MB. The sensors always do continuous autofocus at the time you do recording. The result, recorded objects will always look sharp and focused. But, when I try to record object with a distance less than 20 cm, the camera can’t focus properly. Samsung Galaxy Note video recording quality is good. The recorded objects look sharp, high detail, vivid and it runs smoothly without any lag. There’s a little bit decrease in frame rate when you use it to record a video on a dark place, but it still reasonable. To ensure the video quality, it is recommended to always use the internal memory as a storage option, unless if you use a high quality SD card. The loud speaker quality is mediocre. It is loud enough and quite clear, but unfortunately this phablet using mono speaker that positioned on the back of the phone and facing down. So, if you put Galaxy Note on soft surface such as on the bed, sofa, or on rubber, you will hardly hear the ringtone even at the maximum volume. The in-ear headset that included on sales package performs well. It is comfortable to use and the treble, bass, and vocal sounds good. There are several Equalizer settings you can choose, such as Auto, Normal, Pop, Rock, Jazz, etc. You can also set the equalizer manually. In addition, there are also effects setting such as Wide, Concert hall, Music clarity, Bass Enhancements, Externalization and 5.1 Channel. Samsung Galaxy Note video player application is reliable. You can play different types of file formats such as Avi, Mp4, Wmv, 3gp and Mkv. You can run HD video directly on the Note without any problems. To watch movies on Note is hassle free, you just have to transfer the files to the SD card or to internal memory > done. You can use subtitle to watch the movies. You don’t have to put the subtitle in the same folder with the movie, because you can pick and choose the subtitle to use. If the text is to fast or to slow, there is the synchronization setting. The combination or Super AMOLED screen, fast processor and high resolution display makes the videos looks clear, rich in color and no lag at all. If you think that 5.3” screen is sufficient enough, then this Android phone is perfect as a portable media player. In this Samsung Galaxy Note review, it feels incomplete if I did not discuss about the S-Pen or the stylus. It is one of the major factors that differentiate this gadget with others. First of all, the S-Pen does not use batteries and can’t be used on other Android phones or tablets. Because the Note use capacitive screen that is hard and rigid, we can use s-pen very comfortable, because it feels smooth (slippery) to write on its surface. To navigate on menu and on website: S-Pen function has same function as your finger, so it can be use in any menu of Android features. It is quite helpful when you browsing the website and you want to click some small link. By using S-pen the chance you make a wrong click is smaller. Screen capture: There is one special button on the S-Pen. By pressing the button then touch the pen to the screen for two seconds, the phone will automatically do a screen capture or screenshot. After that you can edit the captured image immediately. You can even do a screen capture while playing games or open applications. Write: If you don’t like or bored typing, you can write. 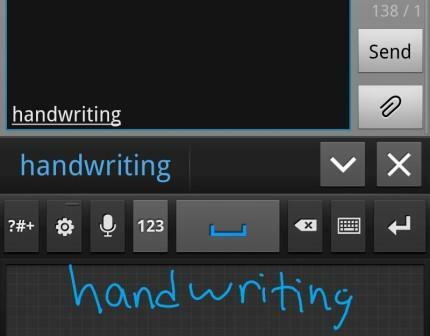 Samsung Galaxy Note has a handwriting recognition feature. This feature can transform your handwriting into recognized text that can be used on any text input application such as messaging, emails, documents, etc. SD card: Shows the capacity or external memory (SD card not included in sales package). The Galaxy Note can use SD cards up to 32 GB. The external SD Card function is to store multimedia files (photos, videos, music), documents, etc. USB Storage: this is internal “SD card”. The remaining capacity detected is 11 GB. It has function to store multimedia files and also Android application or games data. Storage system: It means the phones internal memory. If you install a game or application, it will use or consume the storage system. The remaining capacity you can use is 1.8 GB. Samsung GT N7000 storage system capacity is quite large. You can install many applications and games without worry about running out of memory. The phablet use 2500 mAh Li-Ion battery. The battery capacity is larger than most of Android phones, but we need to remember that the screen is also larger than others. So how does the Samsung Galaxy Note battery life? The performance is fairly standard compared to other Android gadget. Not so good but not bad either. If you use the phone to make a call more than 40 minutes, browsing the internet more than an hour and using other features such as playing videos, games, chat, etc for and hour, then Galaxy note can last for one full day without charging. However the battery performance is also depends on the provider signal strenght. Better signal means better battery life. Samsung Galaxy Note Review, conclusion: this gadget is expensive, but if we look at the specification sheet, I think it’s still reasonable. Beside the spec, this Android gadget has one killer factor that others don’t have, which is the S-Pen (stylus). Maybe some of you skeptic about the S-Pen functionality, but if you already tried, I’m sure you’ll love it. Samsung was not the first manufacture that use stylus on a capacitive screen on Android platform, for example, there is HTC Flyer. And also not the first in phablet genre (there is Dell Streak that use 5” screen). But, we can say Samsung Galaxy Note is a perfect product (for those who need it) without meaningful disadvantage. Do you think that the S-Pen (stylus) is important to have? Do you feel the 4” screen is too small but 7” screen is too big? If both of your answer is NO, then this phablet might not suit you. If your answer is YES even just one of that question, then don’t hesitate to buy this Android gadget.